If you are aware of the history of Chicago Blues than you have likely heard of Alligator Records. If you are not a connoisseur of the history of Chicago’s blues labels, it is useful to know how this label came to be. One of the most important early Chicago blues labels was Chess Records, which was started by two Polish immigrant brothers, Leonard and Phil Chess, in 1950. The Chess roster featured some of the most important blues acts of the day, including Ike Turner, Muddy Waters, Willie Dixon, and Koko Taylor. In 1969 the brothers sold the label to General Recorded Tape. In 1971, a 23-year old blues fanatic named Bruce Iglauer started the independent label Alligator Records, which quickly became a magnet for former members of the Chess stable. The first artist that Iglauer signed and released on his new label was Hound Dog Taylor & The HouseRockers. In 2011 Alligator Records celebrated its 40th anniversary, releasing The Alligator Records 40th Anniversary Collection. Today the label still attracts some of the most innovative contemporary blues artists as well as maintaining a focus on select early blues pioneers, such as Blind Willie Johnson, who was born in 1902. He was not born blind–one oft-cited story maintains that he lost his sight when his angry stepmother threw lye in his face. In spite of going completely blind, by age 7 Johnson started to teach himself how to play the guitar. Willie had a strong passion for both blues and gospel music. After spending some years singing on the streets of Martin, Texas; he moved to Dallas where he met his wife Angeline. He began his recording career around 1927 and only recorded until 1935. Johnson died in abject poverty. 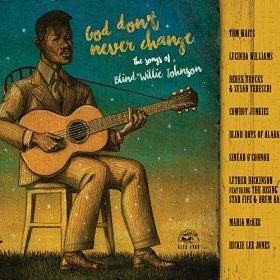 On this release, Alligator Records has assembled a well-known host of musicians to interpret some Blind Willie Johnson’s songs. Some of the outstanding artists featured on this record include Tom Waits, Lucinda Williams, Derek Trucks & Susan Tedeschi, Cowboy Junkies, The Blind Boys of Alabama, Sinead O’Connor, and Rickie Lee Jones. In addition to its great roster of musicians, God Don’t Never Change features 18 pages of extensive liner notes, including beautiful photographs and a detailed essay on Johnson’s life by singer-songwriter Michael Corcoran. Tom Waits’s rendering of the album’s first track “The Soul of a Man” will not disappoint fans of the gravelly-voiced musician, songwriter, and actor. Waits brings in his own deep understanding of blues and gospel music in his minimalist soulful rendition. Lucinda Williams’s performance on the album’s second track, “It’s Nobody’s Fault But Mine” hearkens back to older blues styles, complete with compelling bottleneck slide guitar darting in and around the song’s vocal melody. One of my personal favorite tracks is “Keep Your Lamp Trimmed and Burning,” performed by husband and wife Derek Trucks & Susan Tedeschi. This cut features a down-home feel propelled by Truck’s masterful slide playing and fantastic call-and-response between Tedeschi and a group of backing vocalists. The duo’s impassioned performance keeps the very old song fresh. Cowboy Junkies’ performance of “Jesus is Coming Soon” gives the song’s apocalyptic lyrics an appropriately haunting treatment. This group’s alt-country sensibility plays very well on this song. “Trouble Will Soon Be Over” offers a moment of transcendence, transporting this reviewer to another place. Sinead O’Connor’s sweet and sensitive vocal treatment of this song gives the its aspirational lyrics an inspiring emotional thrust. This 11 song album is definitely worth a listen. While–due in large part to the diversity of the artists interpreting Johnson’s repertoire–there may be a few songs that might not at first blush be your cup of tea, if you listen with an open mind you’ll probably discover some real gems. This entry was posted in Blues and tagged 2016, 2016 Releases, Alligator Records, black music, Blind Boys of Alabama, Blind Willie Johnson, Blues, Cowboy Junkies, Derek Trucks, God Don't Never Change, Gospel, Lucinda Williams, Patrick Scott Byrket, Ricki Lee Jones, Sinead O'Connor, Susan Tedeschi, The Songs of Blind Willie Johnson, Tom Waits by aaamc. Bookmark the permalink.